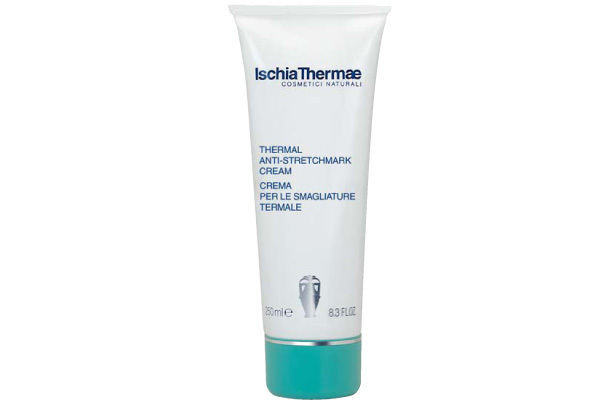 This cream, which has a particularly soft consistency, is Ischia Thermae Skincare Programme’s answer to stretch marks. Its formula, based on Ischia Thermae Thermal Water and a complex of natural active ingredients which tone and stimulate the skins natural functions, helps to prevent the appearance of stretch marks, and with regular and continuous use, significantly reduces the visible signs of already existent marks. The product is particularly suitable during puberty and pregnancy and in the case of major weight loss. The Thermal Cream for Stretch Marks helps to maintain the elasticity of the skin and brings suppleness and tone to the tissues; the skin surface appears more even, smooth and soft as silk. Morning and/or evening, spread the product over freshly cleansed and dried skin on areas where stretch marks usually appear (buttocks, hips, thighs, abdomen) or where they are already present. Massage with circular movements until completely absorbed. For optimum results prepare the skin with Thermal Mud Body Exfoliator, following the instructions for application. In the case of major weight loss it is recommended that this product be applied to those specific areas and Thermal Firming Body Cream be applied to the rest of the body. In the case of stretch marks on the breast, due to the extremely fine and delicate structure of the skin on the area, it is essential that Thermal Firming Breast Cream be applied first, followed by Thermal Cream for Stretch Marks.